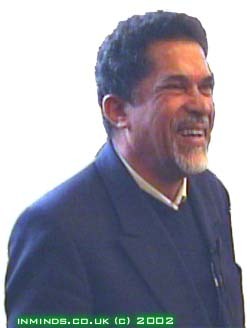 Imam Achmad Cassiem is the Chairperson of the Islamic Unity Convention (South Africa). At aged 15 he joined the armed struggle against the oppressive apartheid regime in South Africa and at the age of 17 he was one of the youngest people to be imprisoned on Robben Island. Imam Achmad Cassiem looks at the history of Muslims in South Africa, and shares with us insights and lessons learnt by their experiences. 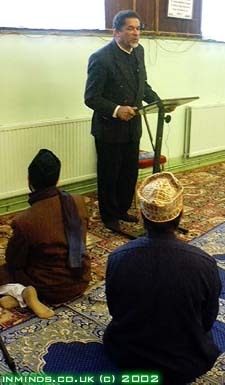 The lecture was delivered on Eid Day in London. The audio is split in to two segments: the 39 minute lecture followed by a 10 minute question-answer session. "... The second group of Muslims who came [to Southern Africa] were faced with the death penalty if they practiced Islam in public. The Dutch word for these laws was placartan, and that they introduced in 1657. Now why would you introduce a law right at the beginning of the arrival of Muslims in Southern Africa? The Muslims came there as slaves, as political exiles, as prisoners of war. Because they knew what these Muslims were capable of. Tonguru - Mister Teacher as its translated in to Malay language is the name of Shahad al Qadr abul Salat. He came there as a prisoner in chains with handcuffs on and leg irons on. Today when we see the Muslim prisoners in Cuba, coming all the way from Afghanistan, from Pakistan and they are taken to a country that is supposed to be communist, but part of this communist country is controlled by a capitalist neighbour the USA which is too afraid to take these prisoners to America so it takes them to Cuba. When this prisoner Tonguru arrived there he had three who were arrested with him in the far east and brought in chains and put on Robben Island where I spend approximately eleven years. He was brought in 1781 and he was released only in 1793. But whilst he was there he wrote the entire Qur'an from memory because he was Hafiz al-Quran, and he also wrote many books on Fiqh [Islamic Jurisprudence], these books are still there in South Africa in the hands of his descendants. And when he was released from Robben Island he said the placartan which forbids Muslims from practising Islam in public must be challenged, so he asked the authorities permission to hold Jumma [friday congregational prayers] and they denied him permission. So he went to have Jumma in a stone quarry, and that quarry is now a childrens playground in Strand Street in Cape Town, in defiance of this law. Eventually they bought a small house in Dork Street in Cape Town and that became Masjid-al-Awwal - the first mosque in Southern Africa. It is still standing there and it is still being used. Therefore the Muslims in South Africa have have an approach to Islam which says that the whole of life is sacred, the whole of the Qur'an is important and not just aspects of it. I like going on hajj, I like to fast during Ramadan but don't talk to me about Jihad..."
"... If a person wants to listen to the message of Allah, which is his right to do, has he not got a right to enter the mosque? 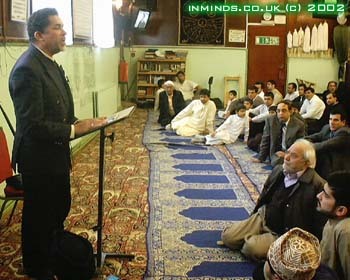 As long as he obeys the etiquette of the mosque he should not be denied. Yet all the churches in South Africa were racist churches, you had churches for blacks, churches for coloured and churches for whites. There are still churches for whites only in South Africa after 7 years of democracy but not a single mosque excluded any human being. So our integrity has been kept since 1652 that we never discriminated against the population..."
"... The one thing which destroyed South African society and is destroying most other societies in the world is racism. The first racist was iblis. He knows Allah created him yet he says I will not acknowledge the superiority of man because I am created out of fire and man is created out of mere clay. He's the first one. And subsequently in South Africa since 1652 right up to 1994 we have racism as a system. You were classified as a asiatic if you came from Japan, India, Pakistan, Malaysia or Indonesia. You are were classified as white if you were of European descent, you were black if you were born in Africa and had a dark skin. And you were classified coloured if you didn't fit in to any of these categories - so that became the rubbish bin of the classification system. I was a bit surprised when I arrived, its the first time out of my country and I come to Britain and the first thing some brothers asked me 'what is your ethnic background?' So I said no, the penny has not yet dropped here in British society..."
"... Reconciliation between oppressor and oppressed is not possible because oppressed and oppressor are not brothers, they are enemies. The exploiter and the exploited are not brothers, they are enemies. And that is why the Prophet (SAW) said "help your brother whether he is oppressed or he is an oppressor", so the companions of the Prophet asked "it is easy to help my brother if he is oppressed but how do I help him if he is an oppressor?" And the Prophet (SAW) said "prevent him from oppressing others". That is our reconciliation. So when people commit crimes against individuals, you as an individual can forgive the person. But when you commit crimes against the community, no individual can forgive that person - the due process of law must be followed, because if everyone is forgiven who harms the community - the community is going to be destroyed. 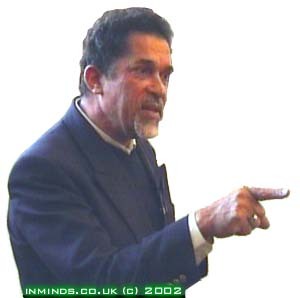 And unfortunately that is our problem in South Africa - that the criminal international crime syndicate that ran this crime against humanity called apartheid, their pensions are intact and they get golden handshakes and the oppressed masses are exactly where they are - 7 million squatters, 8 million illiterate people, unemployment is 40%..."
Open to Question: Interview with Imam Achmad Cassiem, Find out more about Imam Cassiems personal struggle against the apartheid regime as well as his views on drawing parallels between apartheid and zionism. More resources are available from this page. 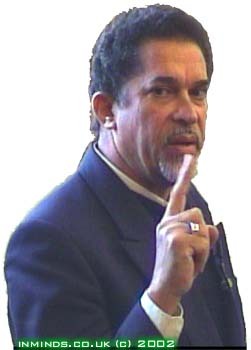 America, Israel & the Durban Conference Against Racism, An account of the UN World Conference Against Racism held in Durban in September 2001. Includes link to the paper presented by Imam Cassiem at the conference.